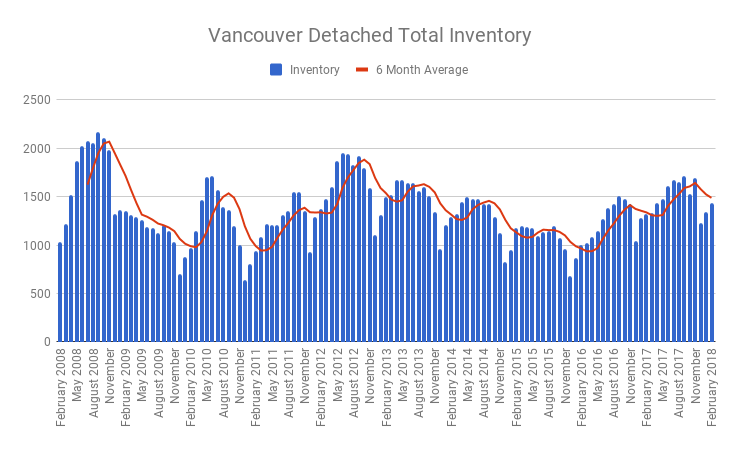 Vancouver’s detached market remained awfully quiet in February, following a continued trend of weaker sales and rising inventory. Vancouver detached sales in the city of Vancouver fell 20% in 2017, dipping to it’s lowest levels since 2008. That continuation is well underway to begin 2018, and with further Government regulations aimed at cooling the property market even further the short term prospects for the detached market remain rather grim. Vancouver detached sales fell to a 27 year low for the month of February. There were just a total of 130 home sales in the area, a shockingly dismal number for a once red hot property segment. 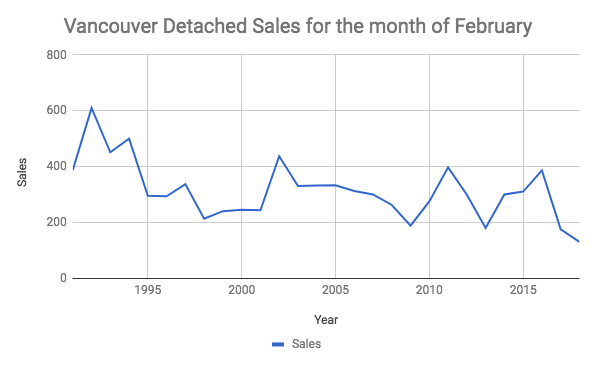 Vancouver Detached sales history for the month of February. On a year over year basis, detached home sales fell 26%. Or 54% below the ten year average for February. New listings, which have plagued the Vancouver real estate market in recent history, enjoyed a solid rebound this February. New listings climbed 32% on a year over year basis, but still registered 13% below the ten year average. Should new listings hold steady it would certainly apply further downwards pressure on prices, given the weak sales. Total inventory levels climbed 9% year over year. There’s currently 11 months worth of inventory piling up, as total inventory has now risen for two consecutive years in a row. The sales to actives ratio dropped on a year over year basis and now sits at 9%. This is indicative of a buyers market (anything below 20%) and further highlights downwards momentum on prices. 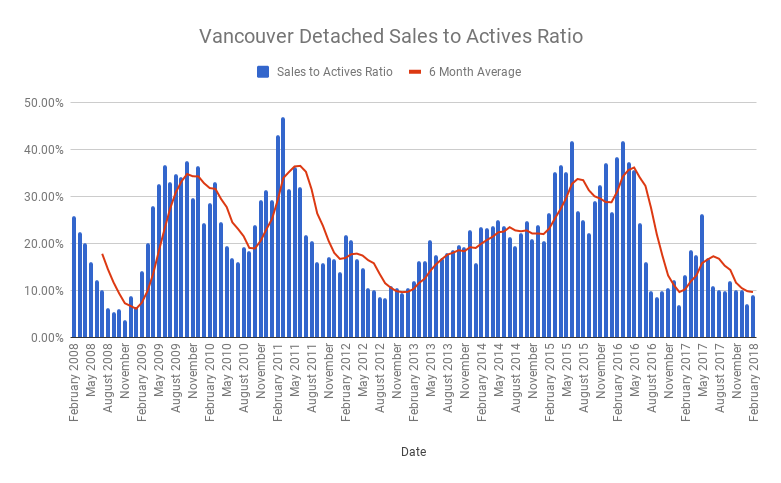 Vancouver Detached sales to actives ratio. The average sales price fell 1% on a year over year basis to $2,646,361. Meanwhile, the median sales price registered a drop of 9% year over year to $2,065,000. This goes in line with most detached homes in the city of Vancouver having dropped about 10% from peaking pricing in early 2016. As expected, the detached market remains sluggish. A combination of mortgage regulations, Chinese capital controls, and Government regulations/ higher taxes have put a lid on the detached segment. The prospects of a mid year turnaround appear bleak, particularly with the prospects of higher taxes on luxury homes and tighter mortgage lending conditions. With a 27 year low for February sales, only homes that are well priced, with more realistic asking prices are moving. Sellers that are willing or needing to sell will ultimately set the new benchmark as prices slide. Perhaps an opportune time for condo owners to bridge the gap, which has never been this narrow.